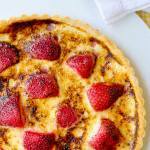 Summer Fruit Creme Brulee Tart - a "make all summer" dessert! Summer Fruit Creme Brulée Tart. A versatile recipe to use whatever summer fruits and berries are at their best, make it with strawberries, raspberries, cherries, peaches and more. 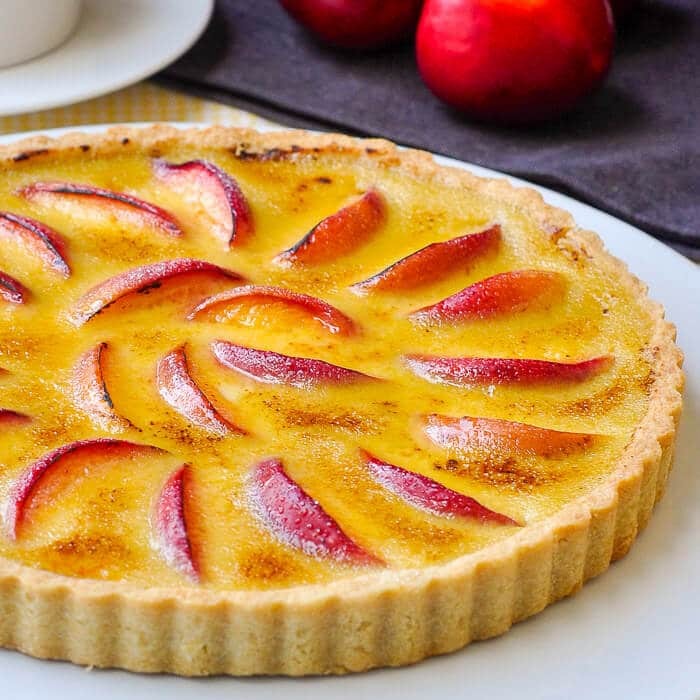 I was going to title this recipe as Nectarine Creme Brûlée Tart but the truth is that this elegant tart could be made with any number of fresh seasonal fruits like peaches, plums, apricots or cherries. I’ve even made it with fresh strawberries in one of my personal favourite versions. Baked in a creamy vanilla custard, surrounded by a sweet butter pastry and finished with a thin, crispy, caramelized sugar layer, this is one very delicious way to enjoy the season’s best fruit. This is one of those sorts of recipes that you break out for a dinner party or to bring to a friend’s house as a BBQ dessert during the summer. I always like desserts that are relatively simple but impressive. They always get the best reactions. Everyone knows when peach season comes in late July and early August here in Canada, I get quite excited. It’s my favourite point on the yearly produce calendar. This year I am planning on making a Peaches and cream version of this recipe which I know will be just fantastic! 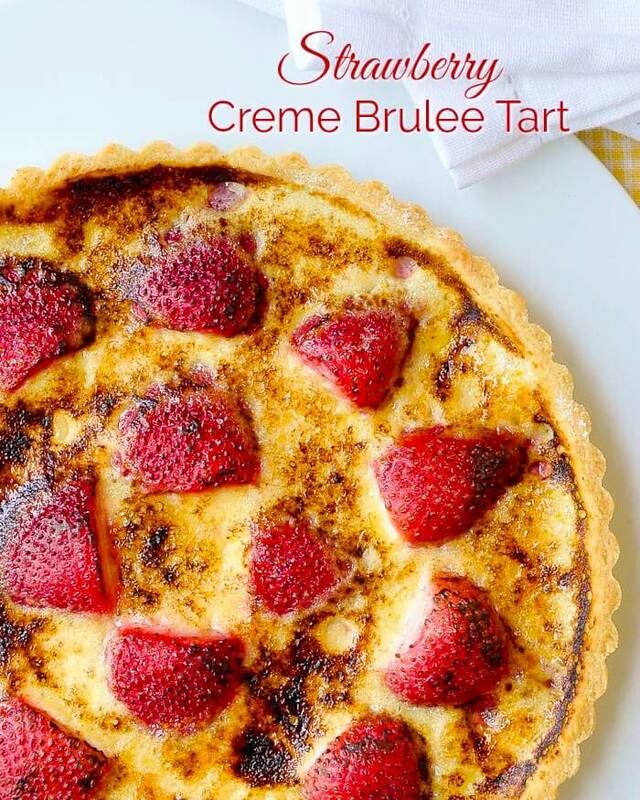 Like this Creme Brulée Tart recipe? Find many other great dessert ideas in our Desserts Section and our Cakes and Pies Section. Summer Fruit Creme Brûlée Tart - a versatile recipe to use whatever summer fruits and berries are at their best, make it with strawberries, raspberries, cherries, peaches and more. Using a pastry cutter, cut the butter into the dry ingredients until it resembles a coarse meal and pea sized pieces of butter still remain in the mixture. You can also use a food processor to pulse the butter into the flour mixture if you prefer. Whisk together the water, vanilla and egg yolk. Pour over the dry ingredients and toss together gently with a wooden spoon only until a soft dough forms. Form the dough into a round, wrap in plastic wrap and let the dough rest in the fridge for at least 20 minutes before rolling it out to about a 10 inch round and place in a 9 inch ungreased tart pan. You will need to blind bake the pastry before adding the filling. Blind baking is essential so that the bottom of the pastry will not get soggy. To blind bake a crust simply place a piece of parchment paper or aluminum foil over the dough and fill the pan with baking weights. (Marbles, dry beans, peas, rice or barley work just as well as anything else.) Bake at 375 degrees F for about 15-20 minutes. Remove baking weights and parchment and bake for an additional 5 minutes. Remove from oven and reduce the temperature to 325 degrees F.
Arrange the fruit slices in the pastry crust, ensuring that they do not touch and that there is room to pour in the custard. In a small saucepan, whip together the egg yolks, vanilla and sugar until light in color and slightly foamy. Scald the cream to almost boiling and slowly whisk into the egg yolk mixture. Cook over medium low heat, stirring constantly until the mixture thickens enough to coat the back of a wooden spoon and you can draw a line through the custard with your finger on the back of the spoon. Slowly pour the custard into the tart pan between the fruit and bake for approximately 35- 40 minutes. Cool completely to room temperature before refrigerating to completely chill the tart. You can serve the tart at this point or you can add a caramelized sugar crust on top. Lightly sprinkle about 2 - 3 tbsp sugar over the top of the tart. Using a butane kitchen torch, wave the flame constantly and lightly over the surface of the dessert until it begins to brown. A light touch is important. Alternatively, you can try to caramelize the sugar under the broiler. You will need to watch it very closely and spin the pan frequently to evenly distribute the heat over the surface of the tart. Chill before serving. You have successfully combined my two favorite desserts into some kind of super-dessert. MIND. BLOWN.